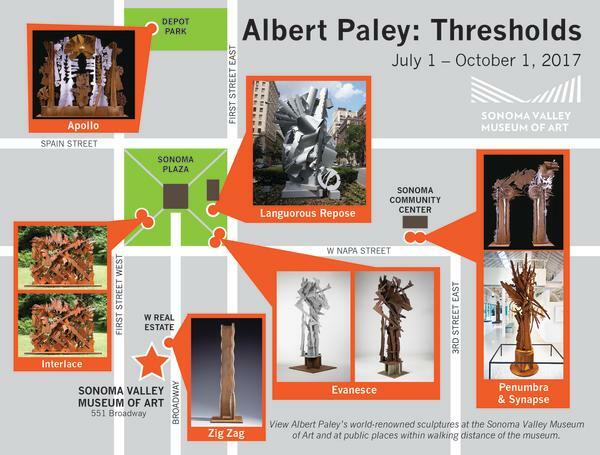 The Sonoma Valley Museum of Art is pleased to welcome the exhibition and public art installation, Albert Paley: Thresholds, to the museum from July 1 to October 1, 2017 and nine large scale sculptures will be installed at four locations to locations around Downtown Sonoma in what will be the largest public art installation in Sonoma ever. SVMA will provide docent led walking tours of the public art installation and museum exhibition. Albert Paley (born 1944) is an American modernist metal sculptor. Initially starting out as a jeweler, Paley has become one of the most distinguished and influential metalsmiths in the world. Within each of his works, three foundational elements stay true: the natural environment, the built environment, and the human presence. Paley is the first metal sculptor to have received the Lifetime Achievement Award from the American Institute of Architects. This exhibition will explore Paley’s process and will feature large-scale sculptures, drawings, and maquettes. This exhibition is presented by Premier Sponsor Bank of the West. As part of its sponsorship, Bank of the West customers receive free admission to the exhibition by simply presenting their Bank of the West mobile app or their debit or credit card. Bank of the West employees also receive free admission to the exhibition. "Albert Paley is one of the most iconic and best known metal sculptors of our time. We are very excited to share Albert Paley&apos;s vision through this museum exhibition and public art installation. Many thousands of visitors and our community will have the opportunity to experience Paley&apos;s art in a unique, personal way. 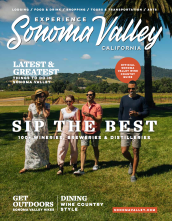 SVMA is proud to partner with the City of Sonoma and Sonoma Community Center and we hope that this ground-breaking project will pave the way for more great public art collaborations in our community." Young Artists + Writers is an interdisciplinary visual art and creative writing summer camp for students ages 11-15, themed to SVMA&apos;s summer exhibition, Albert Paley: Thresholds. Learning a synergistic approach, students engage a variety of art media and techniques to inspire their writing, while their explorations into thematic forms of writing motivate new explorations in art making. Paley is an American modernist sculptor and one of the most highly regarded metal smiths in the world. His large scale works are in museums and public places across the country, and this summer - that will include Sonoma! In this week&apos;s multi-media arts immersion, students will explore the many common elements found in Paley&apos;s monumental works and the natural world around us, translating them into their own visions in the art studio and with written word. Event and workshop prices vary. Get more details about Thresholds and related programming at www.svma.org. The Sonoma Valley Museum of Art is located at 551 Broadway, one half block up from Sonoma’s historic Plaza. Regular Museum hours are 11am–5pm Wednesday through Sunday. Admission is $10 for adults. Children k–12 are admitted free, as are SVMA members. Additional information is available at www.svma.org or by calling (707) 939-7862.